For some reason I'm thinking about zombies today (tip: do not play super-realistic zombie video game just before bed if hoping to avoid bizarre zombie-related dreams) and so when I wrote the title above I immediately thought of zombies. The guy (or former guy) in the foreground of this picture seems like a fair representation of the bar exam: (1) he's wearing a suit and tie, which like passing the bar exam has a weak correlation to legal ability; and (2) both are horribly frightening but also easily survivable, at least if you are willing to just run away. Why more people don't do this is a persistent puzzler in zombie movies and in society in general. For those of you in California who aren't willing to run, can't run, or, more likely, have already paid the registration fee and figure you might as well see what happens, here are some free bar exam outlines drafted for the February 2008 exam, thoughtfully posted by the author of the Bar Advisor blog. My other motive in providing this particular link is that the author also thoughtfully posted a link to Lowering the Bar for purposes of treating bar-related stress, and that is much appreciated. Note: I am not the "Kevin" who identifies himself in the comments there as having failed the bar exam a few years ago. Not that there's anything wrong with that. 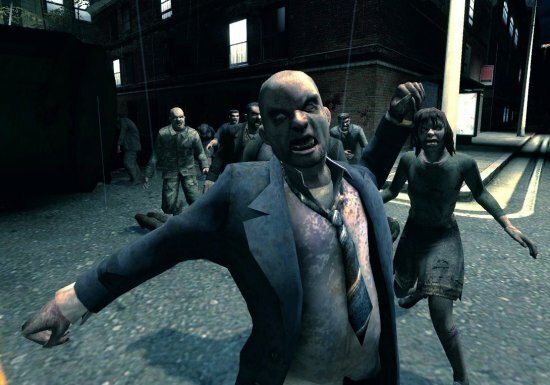 Good luck to everyone now in the final throes of preparing for the February bar exam, as well as those currently being menaced by zombies.